Last Tuesday (23rd September) saw the final Wirral multi terrain race of the series in Arrowe Park. 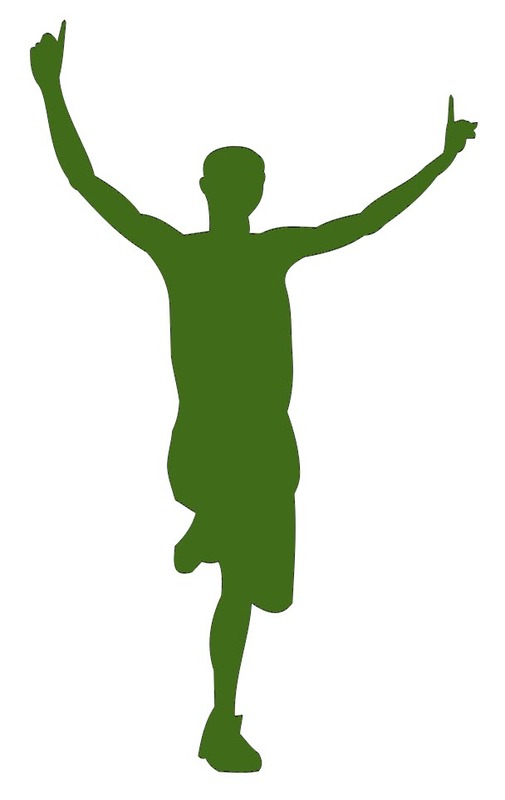 Brilliant running once again saw good results from all in the green vest (8 out in total). Well done to Vanessa who was first Helsby Lady home on the night, but the star of the night was Carol Shaw who came 3rd in her age group and walked away with a trophy for overall 3rdplace in her age category for the series! Special thanks for Joe and Mario who were out on the course to support and Louise Spruce for sorting out the tokens and race positions. Saturday 27th September saw the 79th Delamere parkrun. Brilliant running from Gareth Boyd who secured a top 10 finish and first in for Helsby, and also well done to Dave Madders for another PB (surely one of the most improved runners at the moment!) Great running all. Also on Saturday was the 36th Warrington Parkrun with our sole Helsby representative Colin Bishop who stormed around for a podium finish! Well done Colin. And keeping the Helsby flag flying in Southampton was Alex Fitzmaurice who had a brilliant run to go sub 20 minutes and secure 4th place. Saturday also saw the popular Sandstone A race (17.1 miles, 655m climb) and B race (10.6 miles, 288m climb) organised by our very own Geoff Shaw alongside Deeside Orienteering Club. It was a fantastic turn out once again from the “Green Army” (12 in total) and turned out to be a bit of a Helsby award ceremony with Jayne Joy storming around for first lady home in the B race, Vanessa Griffiths 2nd in her category in the B race, Rachel Arnold 1st in her category in the A race and Jim O’Hara with a fabulous run for 3rd place overall in the A race. Well done to all who participated in this event and it was great to see such camaraderie and enthusiasm from Helsby RC. We also came very close to securing first team but narrowly missed out to Wirral AC, which is an excellent result and shows what a strong club we have at the moment. Thank you to Joe and Mario who once again were out on course in full support and Adair who had cycled over to offer his support. Also thank you to Jenny and Tim Palmer who were out marshalling and cheering Helsby runners on. On Sunday 28th Roy Gaskill headed over to Southport for the Natterjack Seaside 10k as Helsby’s sole representative. Excellent running from Roy saw him edging ever closer to that sub 40 with 40.25 and 45th overall. Well done Roy! “This weekend I found myself running around the Eastern fells of the Lake District at the RAB Mountain Marathon. For those of you that don’t know what a mountain marathon is, it’s essentially a cross between Orienteering and Fell running. The RAB is a “score class” which means a large number of control boxes are placed around an area, each control is worth a number of points ranging from 5 to 40 points. Competitors cross the start line and are handed a map and a sheet of paper detailing which controls are open that day and how many points they are worth, from there they have a set amount of time to collect as many points as possible by visiting the control and “dibbing” using an electronic key which is strapped to their wrists for the weekend. There is a long score (day 1 is 7 hours, day 2 is 6 hours) and a short score (an hour less each day) and anybody arriving late back to camp starts to lose points for every minute they are late (half an hour late and all points are gone – tough if you’ve just flogged yourself through the mountains for nothing). Competitors can race solo or in pairs and must carry all their kit, including tent, sleeping bag and cooker. Although I wasn’t the only Helsby vest there (Andy R was there with his daughter) I took to the field with a friend I’ve met through ultras, Matty Brennan. We’re reasonably evenly matched overall (albeit he is a bit quicker) however Matty’s strength is descending and mine is ascending, so I was really pleased at how we managed to run well as a team despite this contradiction. Crossing the start line we hit our first issue in that the maps supplied were laminated – not great that we both had water soluble markers! Our second error in hindsight was planning forwards rather than backwards and not spending enough time studying the terrain… headless chickens spring to mind. The result of this and a misreading of the out of bounds area meant that we missed a fast route through and we spent too long in the lower scoring controls. We left ourselves without enough time to pick up a more distant control yet we strolled in with 45 minutes left on the clock for day 1 and only 205 points in the bag. Despite the frustration at our mistakes we’d had a fantastic day out. A great overnight camp made better by the mild conditions meant that we were fresh for day 2 and quickly proved that we’d got our eye in map wise. Lessons learned from the day before we set off and really nailed day 2 by collecting 210 points; finishing with enough time not to be panicking about being back in time. Great write up Chris and well done to you, Matty and Andy. 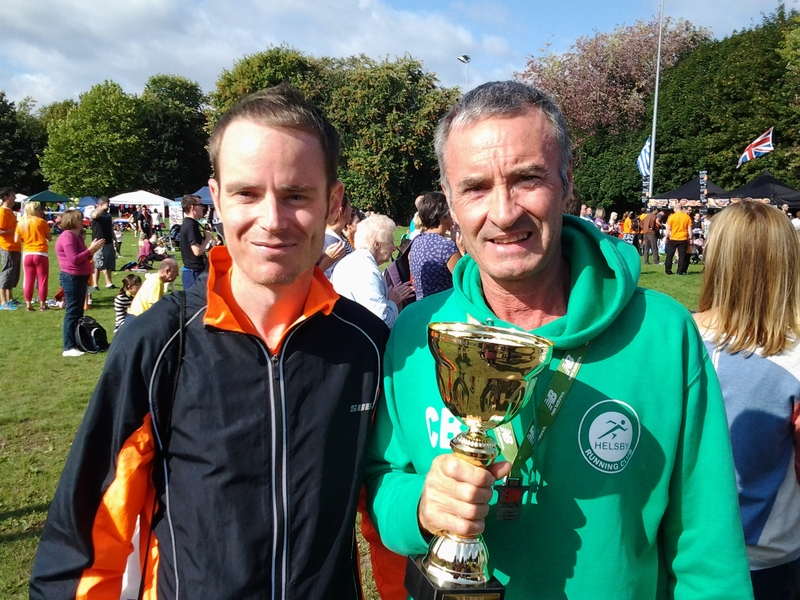 The Macclesfield Half Marathon on Sunday saw the final race of the Cheshire County Road Race GP. Well done to all those who took part in any of these races, final positions saw 1 male from Helsby (myself) in the top ten, and a lady inside the top 20 of Cheshire. Well done Joanne Lacking! Hope I have included all results, if any are missing please email me at col808@hotmail.com. I’ll try to add any photos sent to me. Thanks for reading, and keep on running! It was the Wirral Multi-terrain series Race 3 at Thurstaston on Tuesday 16th September and a good showing for Helsby saw 14 runners don the green vest for a beach and trail run on a nice spot of Wirral coastline. Colin Thompson secured a top ten for first in for Helsby and a 3rd place in his category while Jenny Illidge took the female honours. Well done to Carol who was also 3rd in her age category on the night. A great effort by team Helsby and well done all. Helsby Mens ‘A’ team were 12th on the night and Helsby Mens ‘B’ were 34th. Helsby Ladies ‘A’ were a brilliant 5th place on the night and Helsby ‘B’ were 11th highlighting the strength in depth at the club. Well done to Carol Shaw who is currently in 2nd place in her category for the series with one race to go. Delamere Park Run 5k number 78 on 20th September saw two Helsby vests with Jim Jones having a great run equalling his PB for 19th overall and Emma Barnes establishing a new course PB for 123rd. The King Johns Castle on Saturday 20th September was our 8th Fell Counter of the season. This is a great race organised by John Linley which starts from the Raven Inn at Llanarmon yn lal. Full results can be found below. I’ve included the full results as they are not yet available online. Well done to Rachel and Jenny Palmer who were prize winners on the day and to Jen O’Hare on completion of her first fell race! 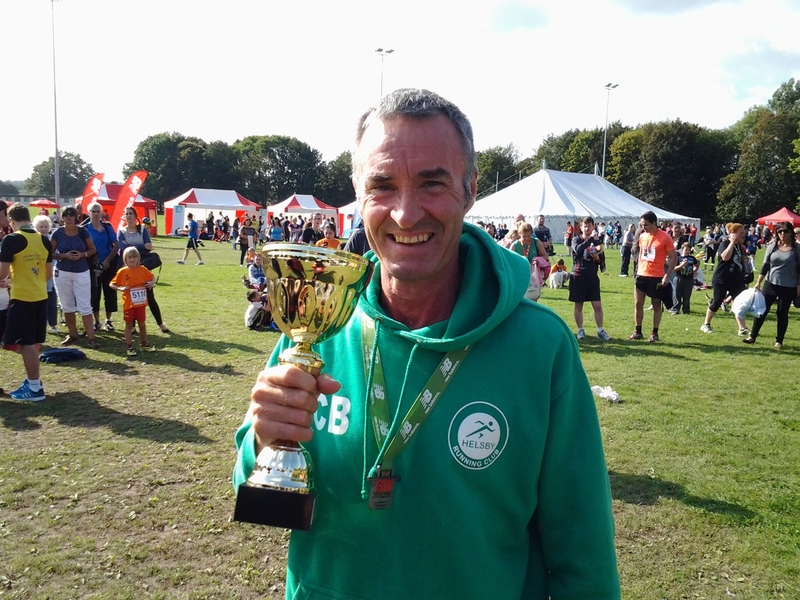 Sunday 21st September saw the (English Half Marathon) EHM Festival of Running 10k with an outstanding run by Colin Bishop to win by a country mile and achieve a PB of just outside 35 minutes. Brilliant stuff and photo of Colin and his trophy will be on the blog. Also as part of the same ‘event’ the EHM Festival of Running Half Marathon was the penultimate road counter for this season and attracted 12 green vests for the challenge. Colin Thompson took the full road counter points and Jane Ashbrook was first Helsby lady. Well done to to Carl and Louise who both obtained PB’s on the day and I know Adrian had trained hard for this event and was awarded with a brilliant run and time also. Well done all. 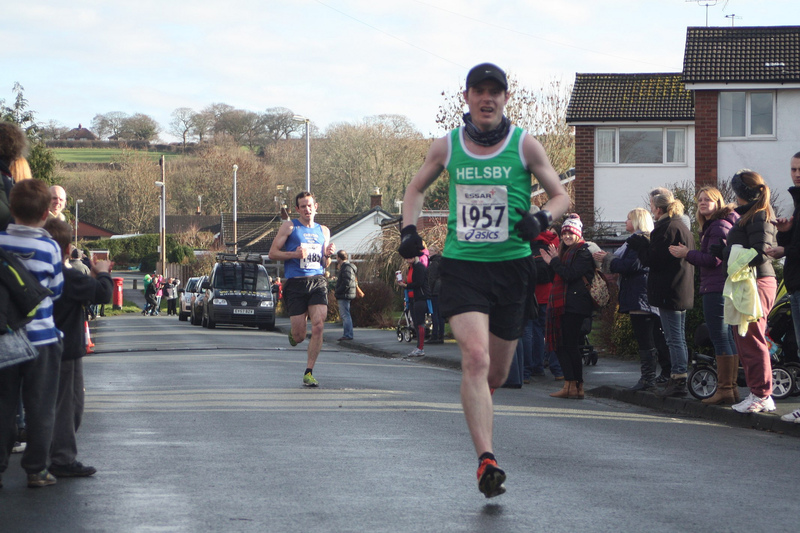 It was also the Guilden Sutton Six (or Sutton Six) on Sunday which saw four Helsbians out with three under the sub-40 barrier showing that Helsby has a strong club now. Excellent effort by everyone. As stated last week I will now be away for three weeks and Colin Thompson has kindly offered to do the round-up for next week Monday 29th September. If anyone finds the King Johns Castle results then please let me know over the next couple of days. Favourite UK Trail Runs Infographic via the Berghaus Community site. Tuesday 2nd September was Race 1 of the September Multi-terrain series was a 4.7m affair at Royden Park near Thurstaston. Nine out for Helsby with Colin Thompson first home for the men and Vanessa first from the Helsby ladies. Mens ‘A’ Team 19th and Ladies ‘A’ Team were 11th and Ladies ‘B’ Team were 37th. Race organiser apologises for delays exiting car park but supposedly the Hotel owner had decided to deliberately block his car at an exit and was being more than a little awkward. Next Race is at Harrison Drive opposite the Derby pool 19:00 start, tonight! Delamere Park Run on Saturday 6th September saw ten green vests with Ed Halliwell leading the Helsby contingent home. Rachel Arnold was first Helsby lady. Sunday 7th September saw Shelf Moor Fell Race, the third of our Inter-club series of races and a good race by Jimmy saw him take home the full 20 points. Rachel Arnold was 1st Helsby lady home. As this was the third and final race in the Inter-club series I have heard that Helsby have done enough to take home the title so well done to everyone who has been involved in any of the races! and well done to Spectrum for organising and collating all the results. 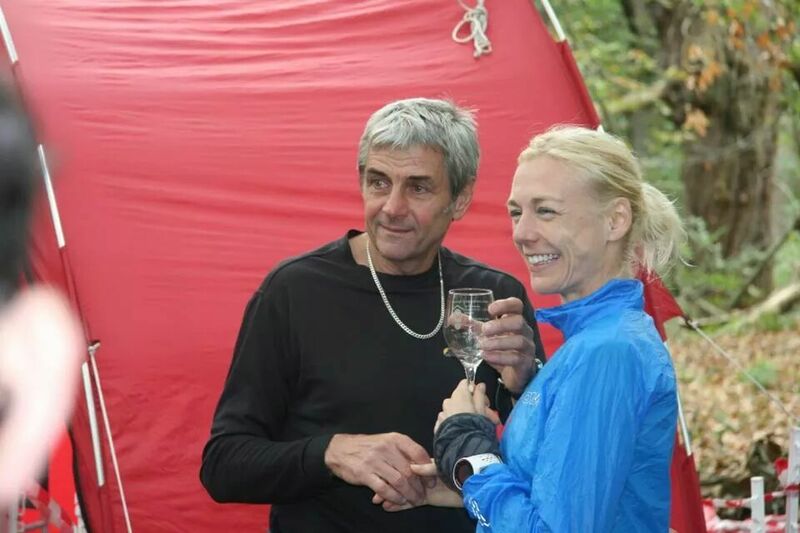 “Jenny and I ran in the Lakeland Trails Derwentwater 10k Trail Race on Saturday and we too received pink T shirts for doing so. The race starts at Fitz Park In Keswick and is very much a race of three parts: after a lap of the park, it is 2.5 miles along the old railway (now a cycle/foot path) alongside (and sometimes over) the River Greta, then a steep climb 400ft in about 1.5miles finished off an exhilarating fast descent back to Keswick. The weather was kind to us and the views were great. 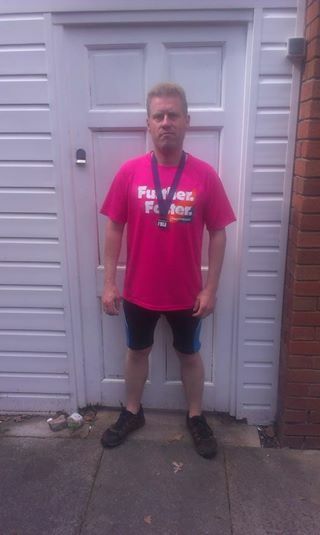 Sunday was also the Salford 10k with four out for Helsby and a storming run by Ivan Davies saw him take home first for a Helsby in a classy sub 40 time. Not sure who the 4th runner was but Dave Madders has been watching too much Doctor Who and was in more than one time and place so all credit to him. If I’ve missed anything from the round-up please let me know as I’ll update the blog as necessary. Delamere Park Run 5k number 75 on Saturday August 30th saw a good podium finish for Colin Bishop who was 2nd overall in 17.31. Janet Robertson was first Helsby lady home for 67th overall in 24.16. Well done to Alex and Claire who both recorded PB’s on the day. Nine out for Helsby in total. “Shall we have starter and pudding? One of my favourite training runs in Snowdonia starts in Llanberis, goes south down the Snowdon valley with a climb up to Foel Goch, along the ridge to Foel Gron and onto Moel Ellio, from there it is a grassy descent back down to Llanberis. It is homely run which leaves you very satisfied afterwards, much like steak and ale pie, chips and peas in your favourite pub. The start and finish of the race was right next to our campsite, so a quality field runners set off in full view of Helen, sat in her camp chair, drinking a Costa. So, back to that steak and ale pie; steak and ale pie is a great main course and is a good wholesome meal in its own right, our starter prior to the main course was a hands and knees climb up Moel Cynghorion (much like climbing the stairs when you were two years old) followed by a steep descent back into the Snowdon valley. This ascent / descent was in the third mile of the race which I recorded as a 29 minute mile! Ok the starter was a bit filling but I am sure I will enjoy the pie and chips and I did; a mile or so up a gradual track followed by a few hundred meters of climb up to the Foel Goch and then the ridge which was fantastic despite the swirling mist. The grassy descent was equally as good. You know that feeling when you feel full but everybody else orders a pudding and you feel obliged to join in, well it was a bit like that the pudding was a steady, muddy climb through some beautifully coloured heater and then retrace your steps back to onto my normal route back to Llanberis. 135 signed up. 106 started. 56 finished. The stats tell a story. It’s a tough but beautiful race. Well done to everyone who tried and a huge congratulations to those hardy 56 who finished. Thanks to everyone who made it so special. A massive thanks to our army of marshals who sacrifice a lot to support us. So long as the demand is there Bing, Q, Rich and team will keep the fire burning. Hope to see you back in 2015. We’ll be launching next year’s event in the next few weeks. Results will also be uploaded in next day or two. Sleep first! Good luck to everyone running in the September Multi-Terrain series this month, a fabulous set of races to be part of! Entry £1. No registration, just tell the Helsby Running Co-ordinator you are here, usually Joe , I think its your best 3 races to count in the series. Great races, all recommended. To lift share for the first couple, meet at the club ready to leave at 6pm, this will give plenty of time to park up as it’s a popular race with limited parking.